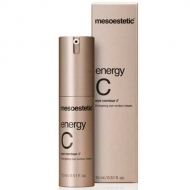 Improves skin's nourishment and elasticity by fighting fine wrinkles and fine lines. 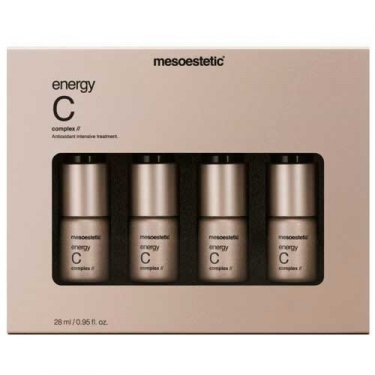 DESCRIPTION: Energy C Complex from Mesoestetic is an intensive 4-week treatment with antioxidant, moisturizing and tensor action. It stimulates the skin's own ability to protect against free radicals, keeping it in a state of eudermia. 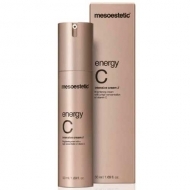 Ultra concentrated vitamin C (10%) is wrapped in the protective cap to retain its intact properties until the time of its use. After release of vitamin C, the serum should be stored in the refrigerator and used for 7 days in a row. Each bottle corresponds to one week of treatment. To maintain the skin in optimal conditions, it is advised to repeat the treatment every 4 months. Apply the contents of a pipette (1 ml) at night on the face, neck and lap through a gentle circular massage until completely absorbed.